When asked by Mom Central if I would like to try Breakfast Breaks, I said "Sure!" I like to have some convenience foods on hand for those times when life becomes too hectic, and was intrigued by these boxes of breakfast. We received 2 boxes and I popped them into the pantry. Each box contains a bowl of cereal (we received Honey Nut Cheerios and Cinnamon Toast Crunch), a cereal bar and a box of apple juice. The box also contains a small plastic spoon, a wet wipe and a napkin. 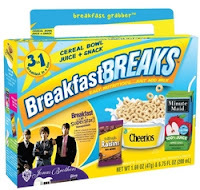 From the website, I see that some boxes contain graham crackers or raisins in lieu of the cereal bar. Personally, I would have preferred to receive raisins, as a bowl of cereal and a cereal bar seemed overload on cereal. I envisioned using these boxes for the boys when we had an early morning errand, or when I had a long night with L. I was grateful to have them last week when N & L came down with the flu! C didn't get sick, and these boxes came in handy for him. He was able to open the box and enjoy a simple breakfast with minimal fuss. He wished the boxes held milk (he likes the taste of shelf-stable milk, so that seemed like a good addition to him), but it wasn't difficult to get milk from our refrigerator. I have a friend currently going through a rough pregnancy, and I'm going to pick up a couple of these for her preschooler. I think they would also be a fun treat to bring to a family after a new baby is born. In the past, I usually bring the kids a pack of small cereal boxes, but this would be a fun item to bring new siblings! These are definitely convenience foods, with a price to match ($2.50 - $3.00 a box). It is nice to have it packaged for those times when a quick breakfast (or snack) is needed and nobody has time to put something together. I will probably hide a couple in the pantry for those situations.